This first Summer School was associated with AFMBioMed Summer School Marcoule 2011. The school welcomed 26 trainees coming from 12 countries: Belgium, Croatia, France, Germany, Ireland, Italy, Norway, Poland, Romania, Spain, Switzerland, UK and 14 instructeurs. 10 travel grants were given by COST Action TD 1002. 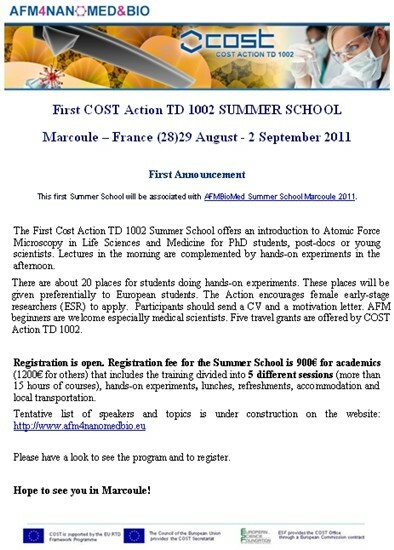 For complementary info, please visit AFMBioMed Summer School Marcoule 2011 website. Please download and post the flyer for the Summer School.